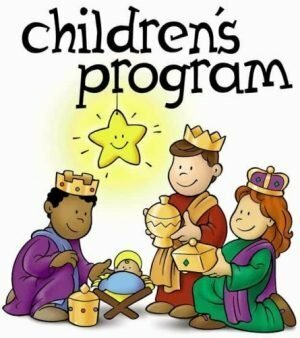 Preschool Sundays are scheduled throughout the year as special occasions to showcase the progress made by all the precious children enrolled in Mt. Olive Preschool classes. Preschool children and their families are all invited to attend. All the preschool classes sing for their families and the congregation at the special Preschool Sunday Worship Service at the normally scheduled time. 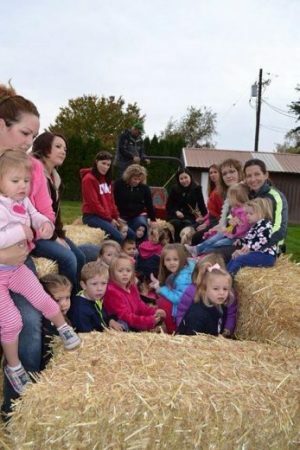 Each October we host an on-site Harvest Festival for all our classes and their families. Last year’s event featured a bouncy slide, an obstacle course and a hay ride. All the students helped make pumpkin play dough to take home, and enjoyed some tasty treats provided by our Preschool Board! Each age group performs their own Christmas program. Who doesn’t love watching 3-year-olds sing and dance to the “Reindeer Hokey Pokey?” Our students love learning about the Christmas story as well as traditional holiday songs they perform for their families each December. 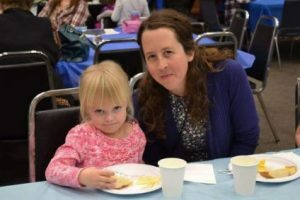 Mother and daughter at the Pasta for Parents Lunch. In January we host a Pasta for Parents luncheon to honor our parents and to say thank you for their hard work. Our preschoolers help design and create table centerpieces to show their thanks. Everyone enjoys a yummy pasta lunch together. Throughout the year, we keep several pieces of your child’s art work for our yearly art show. We frame each child’s work. All the art work art is displayed at our Spring Art Show. It’s amazing to see what these kids can create! Everyone enjoys viewing and admiring all the art created by our students. We welcome all parents to volunteer in class, weekly, monthly or once in a while. We always enjoy having an extra set of hands to play games, help with art projects, read stories, and listen to our preschoolers tell you about their day. A short background check is required before volunteering.